A couple of pics from what appears to be the biggest snowstorm to ever hit Baltimore. 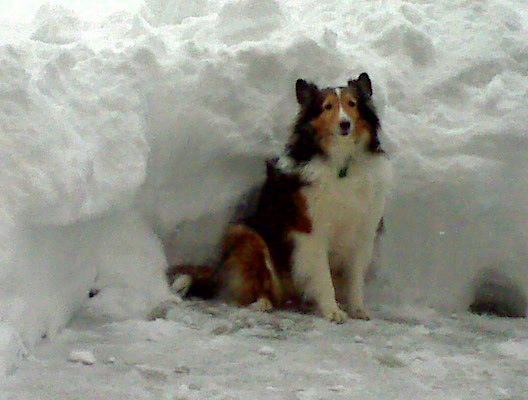 The snow is a little more than one dog deep. Mr Foot rightly calls out local weather folks, as is kids yet again accurately predict something they missed. What did they receive? Slightly more than a dusting, Mr. Bass of Baltimore’s CBS Channel 13 WJZ. Slightly more than “just this much” as shown in an index and thumb together hand gesture by another local forecaster. Gentlemen, the public deserves better; members of your TV audience are more satisfied obtaining their weather from high school students. Perhaps that is the way it should be. Unless the public sees changes to TV forecasting procedures for the next storm, my relatives in Crisfield, MD can cook up a nice dish of crow, with Old Bay seasoning, if necessary. Think that’s too hard-hitting? Care to hold us accountable for the forecast? We welcome your perspective on this issue, for or against. Please share your thoughts on our facebook page or in the comments below. You tell ’em. I know I’ve been paying more attention to these kids than the pros. Today’s snowstorm could be in the top 3 in Baltimore. Foot’s Forecast says 28 inches, which would be behind only the February 2003 storm. Slow down a little and enjoy your friends and family today. Here’s a list of things I saw today at the Safeway in the Canton neighborhood of Baltimore, Maryland. Please keep in mind there is a local panic because it is going to snow tomorrow. Heading off to the gym!